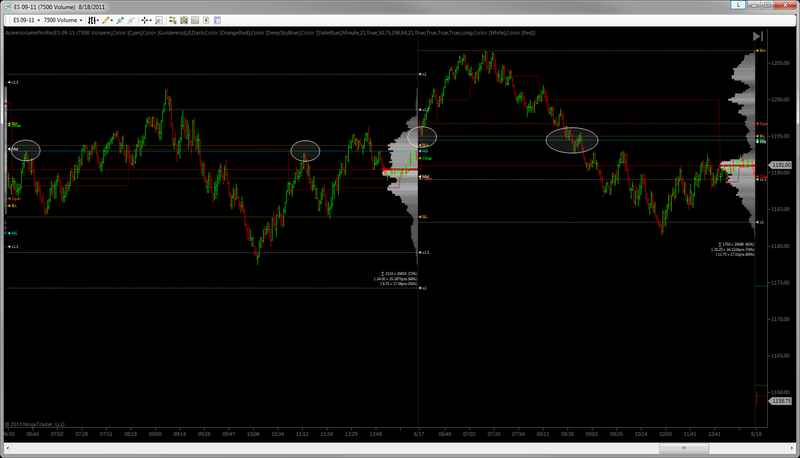 Do you trade price levels? 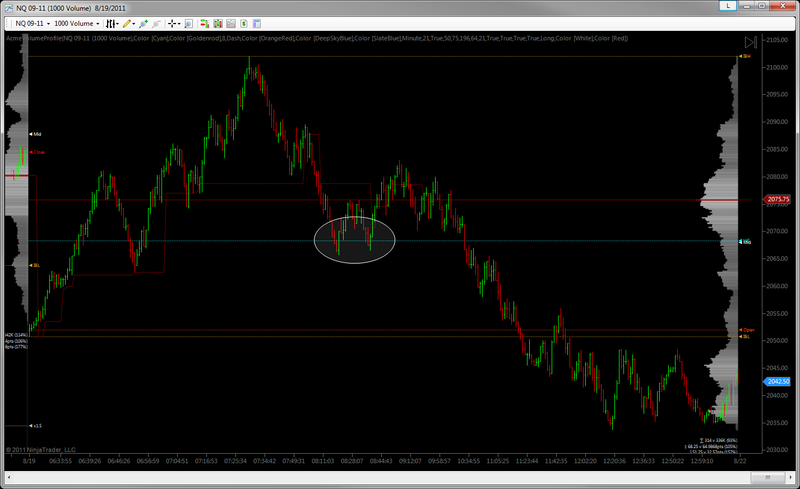 Do you find it kind of tedious to transfer your daily levels/trade plan onto your charts? Do you have an indicator that can do it for you? 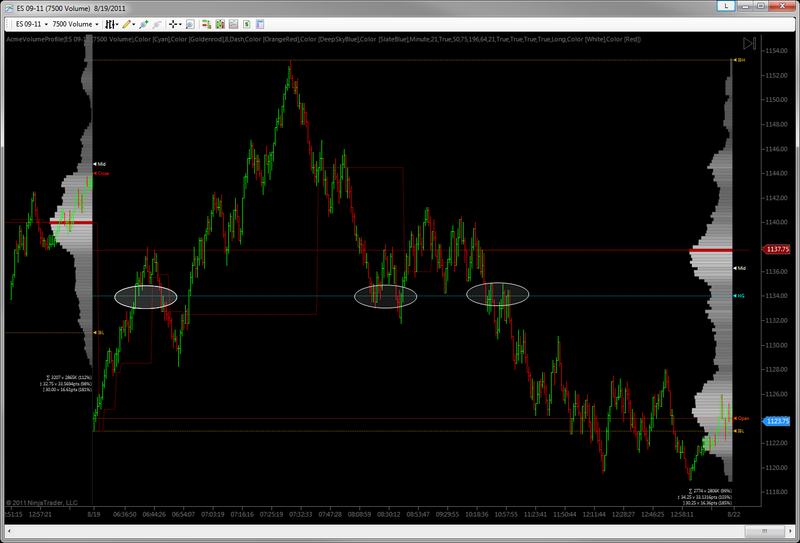 Do you have one that can even draw it on all of your charts for a given instrument, all at the same time? If you don’t, then brother (and sister) do I have a pack for you. Check it out. Trade ’em well. Fix: changed the description for Style – Max Font Size setting to something that makes sense in English. New Feature: For a certain member who make a good case for a size filter, your ship has come in. Once again, you asked for it. You got it. You can grab it here. Comment Poll – Bring on the Noise? A number of the Acme indicators and studies have the ability to play sounds at important events, though I have been leaving those features out of the packs so far. Why? Some folks are very sensitive to code reading from or writing to their hard drive. Justifiably so. Playing sounds requires directly reading sound files stored on your hard drive, and earlier I pledged to not do anything like that in the FAQs. One good example is in the Acme Time and Sales Pack. In my private version of Time and Sales, when a “buy” block comes across the tape it plays a high cowbell sound. 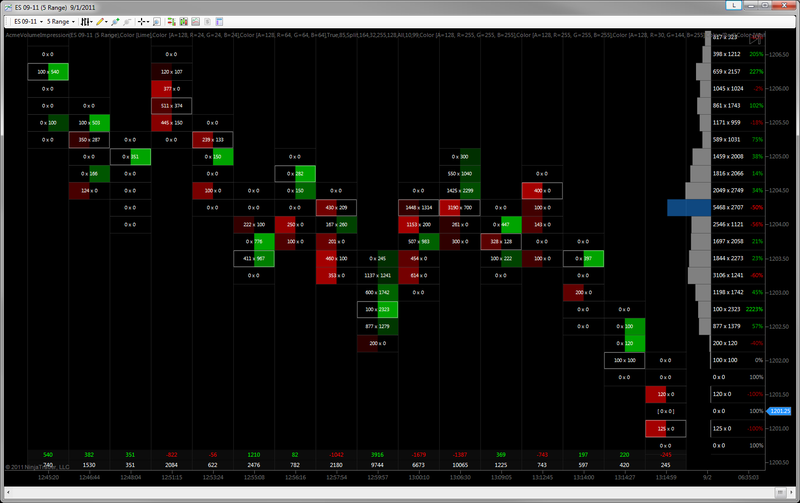 When a block “sell” order comes across, a low cowbell sound plays. 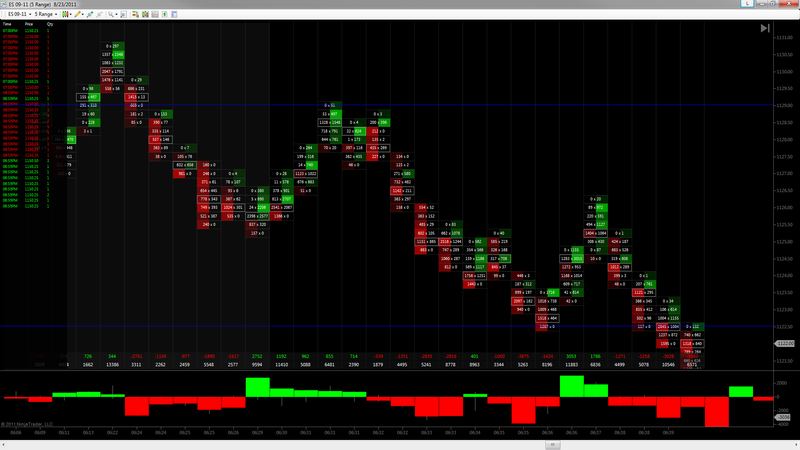 That way I can hear when order flow pace is picking up from another room if I am not at my trading desk. Another example is the Acme Bar Timer, also in the Time and Sales Pack. In my version it can play a sound for the RTH session opens and/or closes. 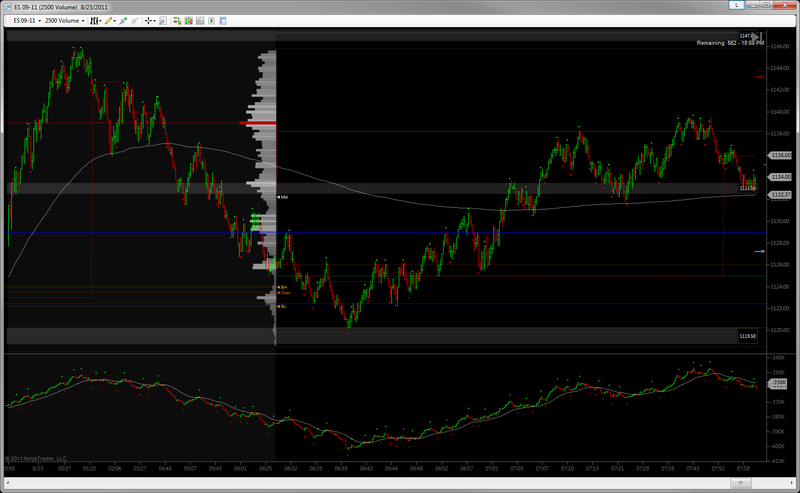 What’s more, the market internals packs I am prepping for release can also play sounds for important events. I think these are a whole lot less effective without sounds, because when things are moving fast it can be really hard to watch them and watch the instrument I am trading at the same time. Of course, if the packs had sound features you’d be able to play whatever sound you wanted for a particular event. Edit: You’d be able to turn them on and off too. Also, there is a way for you to protect yourself by having Windows limit the locations/folders from which files can be read. But, to be honest, it’s really complicated to explain and set up, and I can’t be supporting Windows security configurations in addition to Acme and NinjaTrader. Lastly, at this point it’s just not practical for me, from a time management perspective, to make separate releases for those who want sounds and those who don’t. Thus it’s all or nothing, at least for now. So what say you? Sounds or no sounds? What if anything would make you feel OK about having the Acme packs read sound files from your hard drive? Please leave your comments below, or if you want to express something less publicly you can use support AT ranchodinero.com. /wp-content/uploads/2016/03/Acme-Logo-8-2-1.png 0 0 El Duque /wp-content/uploads/2016/03/Acme-Logo-8-2-1.png El Duque2011-08-29 09:51:552011-09-29 08:26:48Comment Poll - Bring on the Noise? 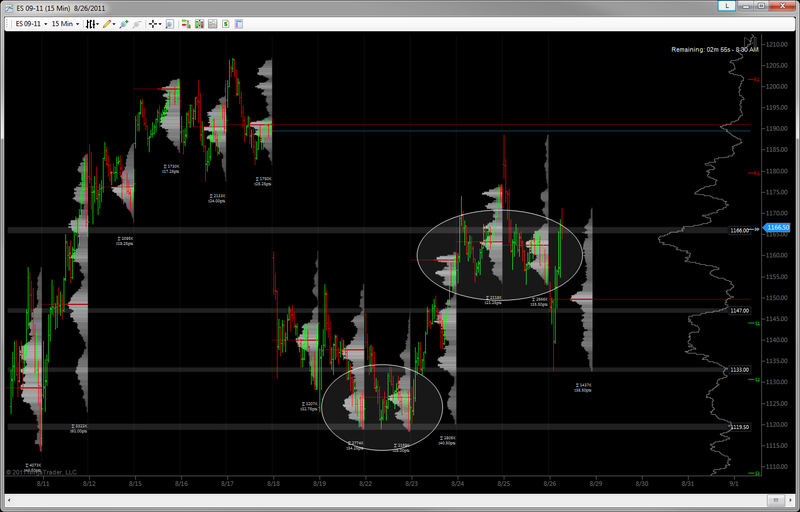 If you are a volume profile or market profile trader, one of the things I think you have to really understand is the so-called initial balance (IB). If you’re not sure what the IB is or you have not studied how price to reacts to the initial balance later in the day, this study is for you. 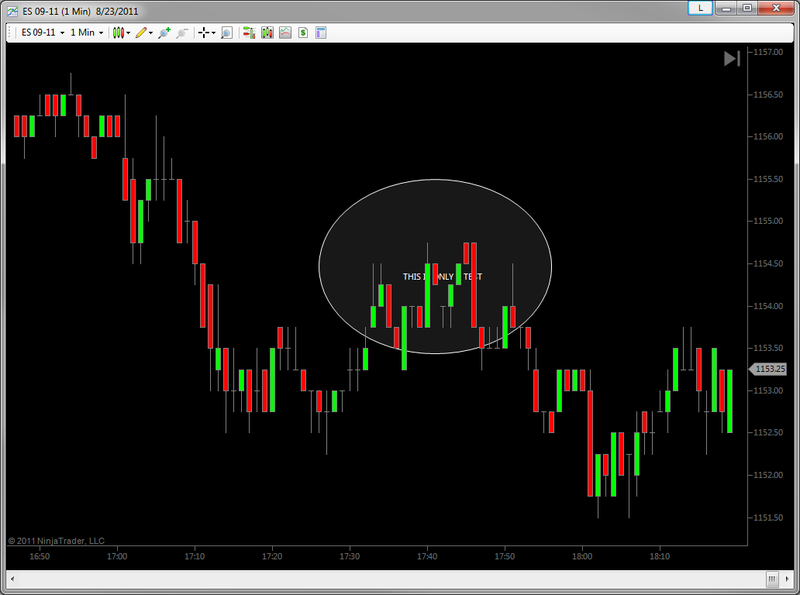 Again In the spirit of bringing to light some of the more useful but obscure bits of NinjaTrader, this time I’ll show you how to work with indicators not just on the X and Y axes, but on the Z axis too. If you’re not sure, the Z axis is the simply front-to-back dimension. 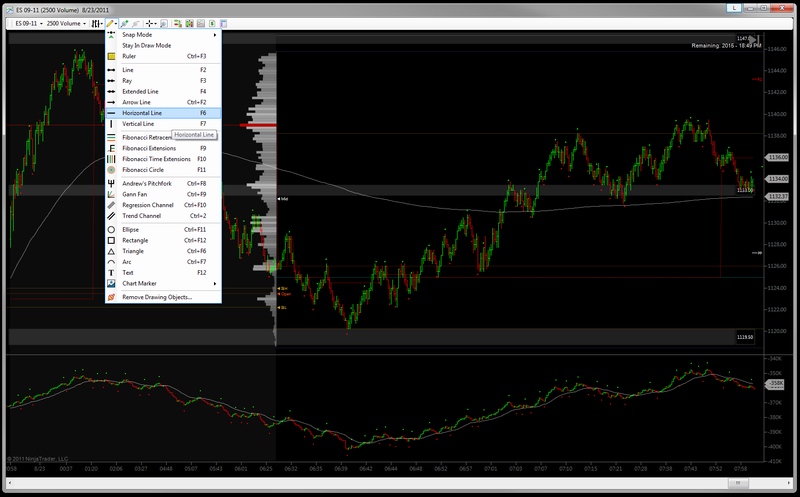 I’ll bet most people don’t realize that NinjaTrader 7 renders everything on your charts in separate layers, and that you can move bars and plot lines between those layers. Want to see how? but you wish they were behind that same something, you can make that happen pretty easily. But it is a little bit fussy. You have to click on the bars until you see some small squares appear over the bars. If you don’t get it on the first try, click again a little to the left or right. Note: If you missed any of the previous installments you can find them here. Have a look at this hot-off-the-press study which drills down into trade size and frequency for some of the most commonly traded futures instruments. Have a look and see what you think. Will it change the way you look at price movement and volume? /wp-content/uploads/2016/03/Acme-Logo-8-2-1.png 0 0 El Duque /wp-content/uploads/2016/03/Acme-Logo-8-2-1.png El Duque2011-08-25 19:13:532011-09-29 08:27:06What's in a Tick? 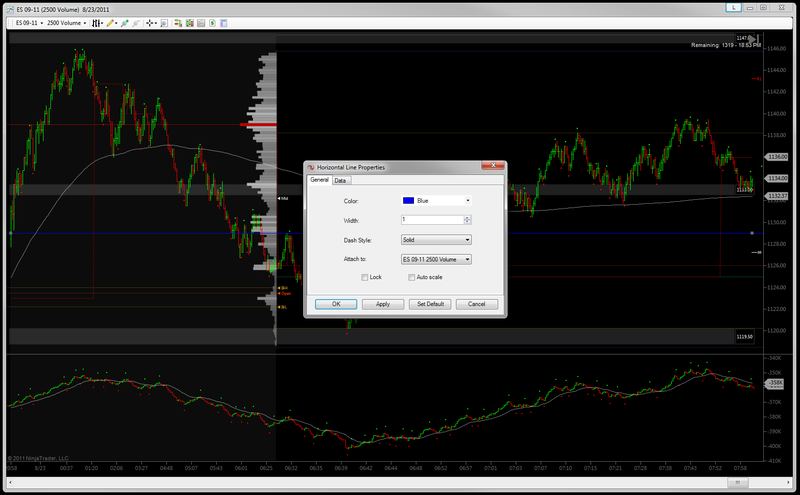 In part one, I talked about colors, transparency and showed how you can use them to get the most out of your chart real estate.This time, I’ll show you how you can use the drawing features in NinjaTrader to mark the opening swing (or any other price level) on one chart and have those horizontal lines appear on all charts automatically. 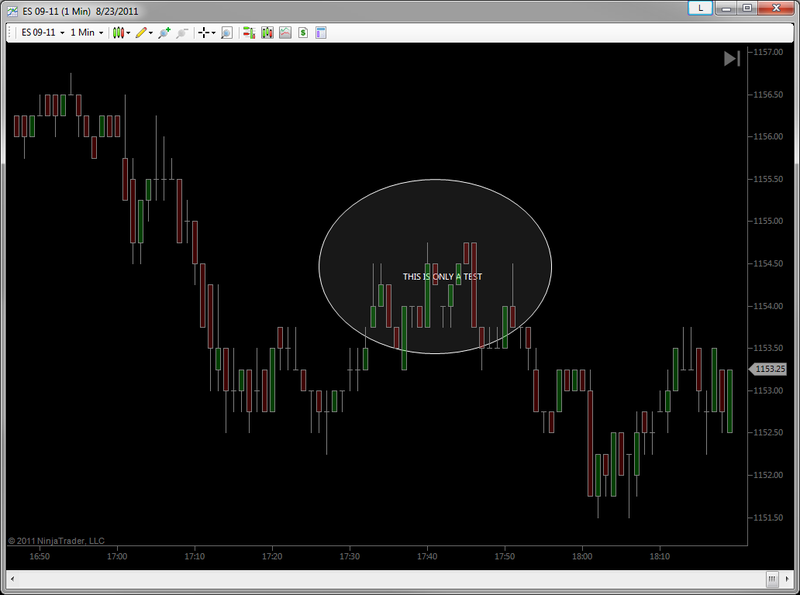 By the way, this same trick works for all the NinjaTrader 7 shapes such as circles, rectangles and even text. 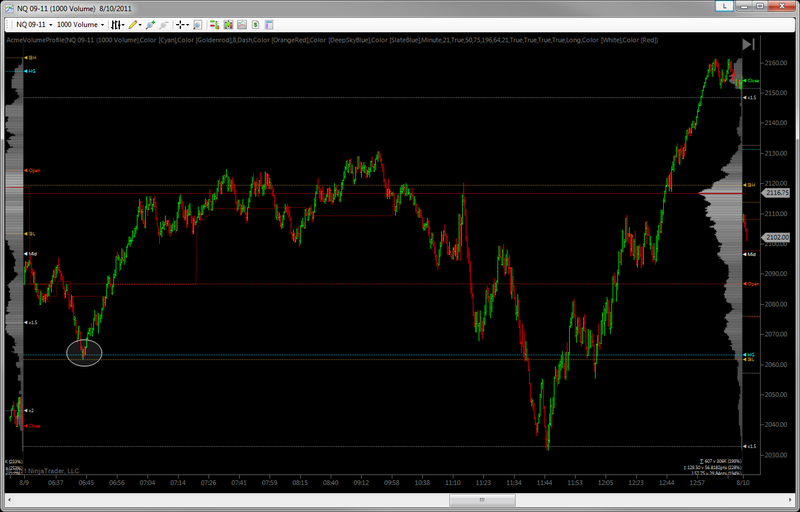 I am starting a series of mini tutorials on Ninjatrader 7. Not how to create a chart, or anything like that. More like how to tweak it to really make it your own, and overall make NT as useful as possible. Basically, the series will be things you didn’t know you needed to know about NT7. Well, maybe you didn’t need to know them, but along the way I’ve discovered some things which are extremely useful but not very obvious. Hidden gems, if you will. It’s part of NT’s inimitable charm, methinks. So, here we go. Did you know you can make colors in NT partially or completely transparent? I love to use transparency because I typically have a lot of drawings and lines on my charts, and when they are not fully opaque nothing is ever really hidden. So how do you do it? The geek term for it is the “alpha channel.” In computer graphics, all colors are represented by some combination or red, green and blue, and each of those colors are in turn represented with numbers in the range of 0 to 255. 0 being very dark and 255 being very bright. Now, most don’t realize that there is a 4th piece of the color puzzle. Yup, you guessed it, the alpha. 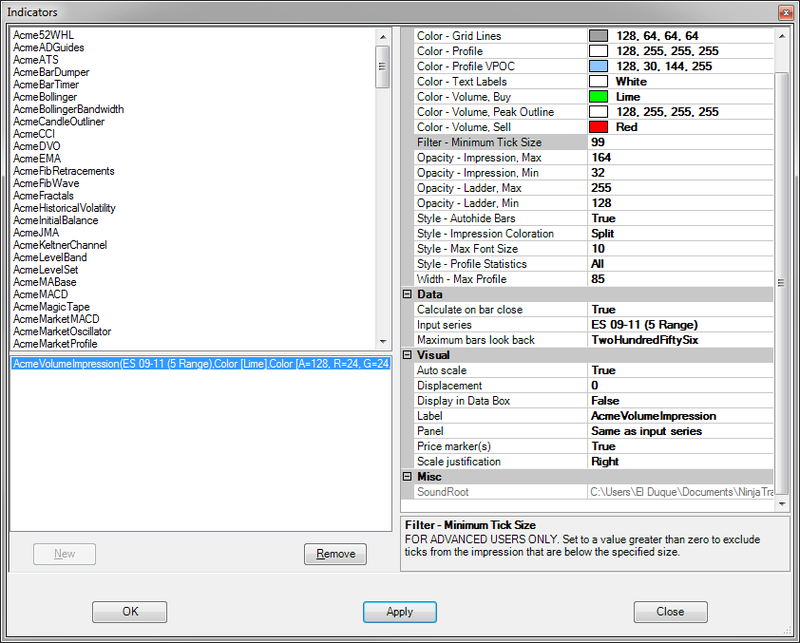 The range of possible values for the “alpha” or opacity part of the color is also 0 to 255. 0 being completely transparent and 255 being totally opaque. for alpha, red, green and blue. Until next time… trade ’em well. 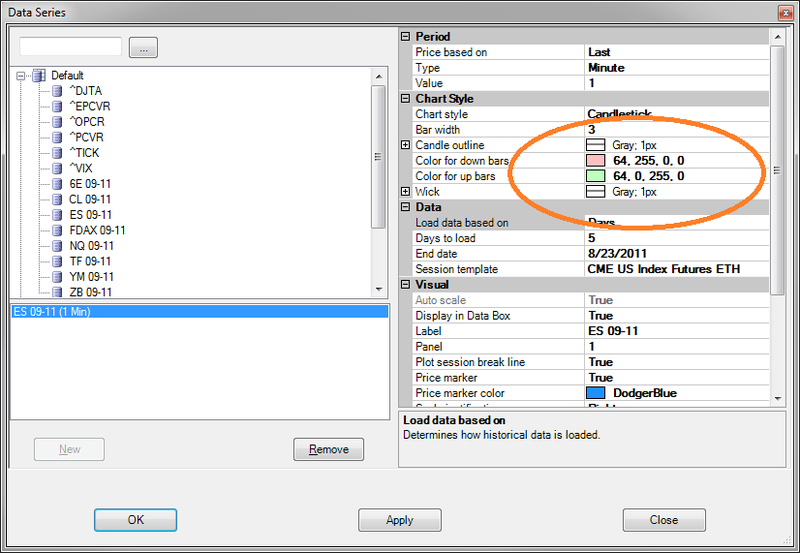 Update: in part two I show you how to draw shapes all charts for a given instrument at the same time. Folks, if you are as bad at reading the DOM as I am this one may be for you. It’s the Acme Time and Sales Pack which features the debut of the Acme Magic Tape study. Yes, it is in fact named after 3M’s cellophane tape. Har-dee-har. It just sort of rolled out of my fingers when I was naming it, and it seemed kind of funny, so it stuck. Get it? Stuck? But it is a real space-saver and fills a vital if peripheral role. I use it on my soon-to-be released Acme Volume Footprint chart. Check it out… and trade ’em well. P.S. My plan is for this one to remain part of the freely downloadable Standard packs, in case you are curious. Can a Half Make You Whole? If we are talking about a phone number, a maple-bacon doughnut (don’t knock it ’til you try it) or having only 50 cents in your pocket at the Dollar Store… probably not. In any of those cases, you’re gonna need the entire thing. Both of these instruments love to tag, roll around on and (dare I say it) caress the half-gap (HG) line. Many traders focus manically on the gap fill, and in doing so they fail to notice how important the half-gap level is intraday. 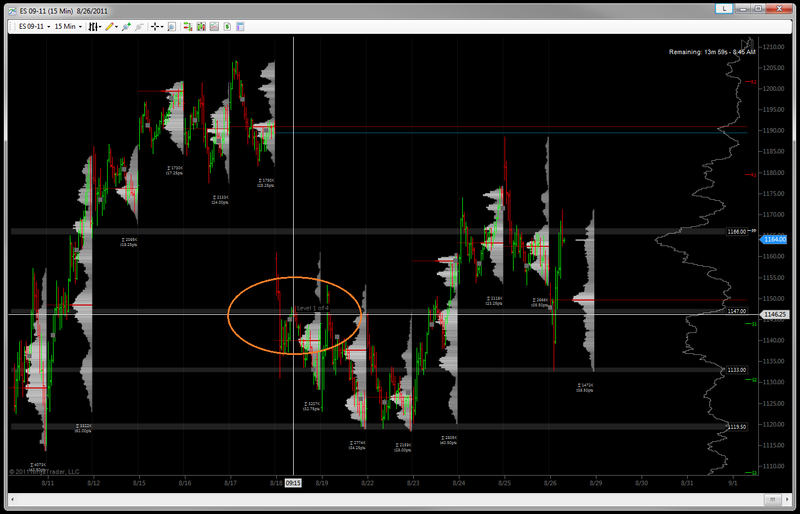 The HG level is very frequently in confluence with another important level, such as a IB, range midpoint, daily pivot or Fibonacci level. 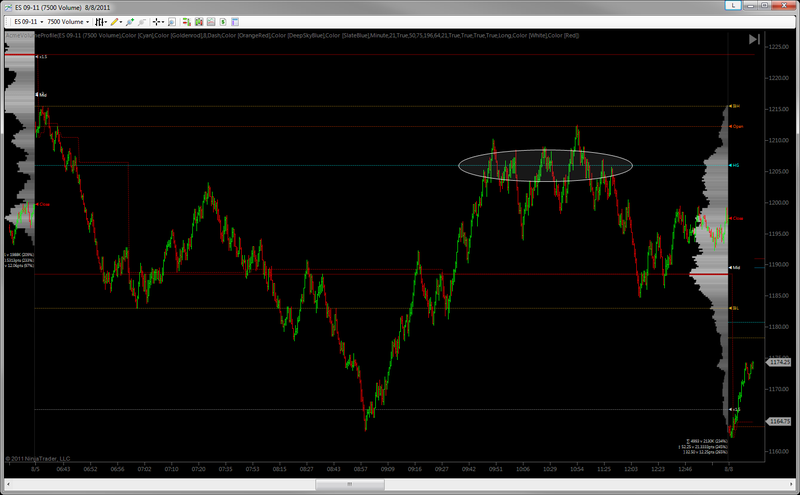 When evaluating a potential level, I look for confluence. 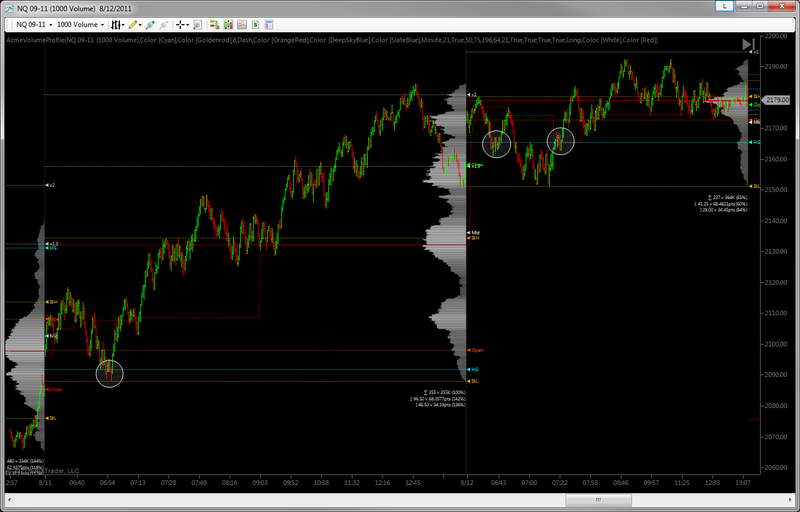 Said another way, when the half-gap lines up with market structure I’m often lining up to trade it. The HG line is something I’ve been drawing manually on my charts for quite a while now, and it’s been on my list of features to add to the Acme Volume Profile for some time. Well, it’s finally available in the Deluxe Edition. Unsure? Want more? 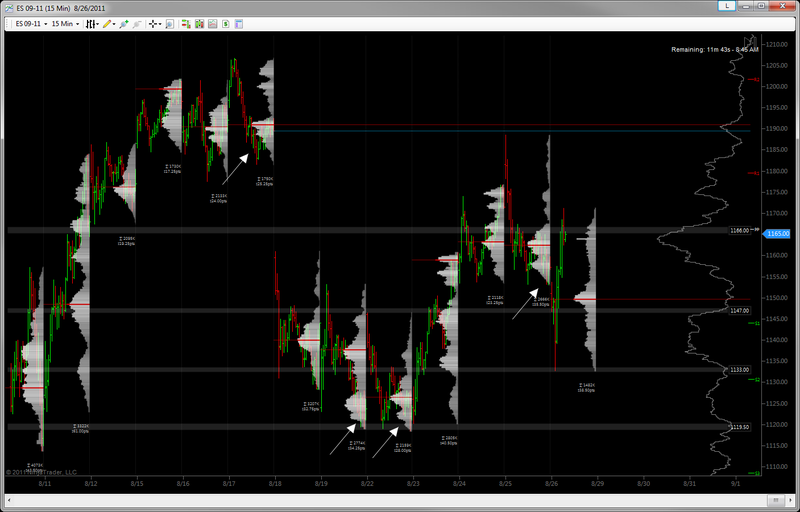 Here are several recent examples from both the ES and the NQ. Final ES example, this time from 8/5. This is the kind of caressing or “flirtation” I was referring to. Several probes of the HG from underneath, then a failure and race down to the VPOC. But not before a back-testing the level… twice! Trade ’em well… should be an exciting week. /wp-content/uploads/2016/03/Acme-Logo-8-2-1.png 0 0 El Duque /wp-content/uploads/2016/03/Acme-Logo-8-2-1.png El Duque2011-08-21 13:55:352011-09-29 08:31:21Can a Half Make You Whole?